I recently posted on a review of Jack Kirby as Auteur by Barry Pearl. In the comments section of that post Arlen Schumer placed text “adapted from the visual presentation at the New York Comic Con panel, Saturday, October 15th, 2011”. I felt that Schumer’s text was much too important to leave in the relative obscurity of a comment section, so with his permission I have posted it below. I believe this is the first time I have ever had a guest posting in my blog. I would like to add my two cents. Frankly when I first heard of the idea I already hated the term used. I rather dislike it when foreign words are wrapped around a simple concept. After all auteur is just the French word for author. However the term is relatively unimportant, at least compared to the underlying concept. I attended Schumer’s panel and found the presentation quite convincing. I do, however, have a couple of quibbles. One has to do with the panel’s and text’s discussion of the legal issues between the Jack Kirby estate and Disney, Marvel’s recent owner. While the court battles concerning these issues might have been the instigation for the developing of the Auteur Theory of Comics, the legalities have no bearing on the theory and the theory has no bearing on the legal issues. As long as the work by Kirby is legally considered work for hire it does not matter if he is considered the author of the work, his estate cannot claim the copyrights. The other quibble is not so much a disagreement with Schumer but rather an uncertainty on my part about how far the term author can be applied. While is seems eminently suitable for artists that work under the Marvel Method, should it be applied to artists who worked from a script? Such artists could be described as illustrators but I feel they have much more impact to the finished work than a typical book illustrator. However to me there still seems a great difference between artists who worked the Marvel Method and those who worked from scripts. I believe ideas such as the Auteur Theory of Comics have great importance. We may not be able to correct past financial injustices, but we can correct failures to provide proper credits. While working with Stan Lee, the most credit Kirby (or Ditko) ever received beyond providing pencils was for supplying the plot. 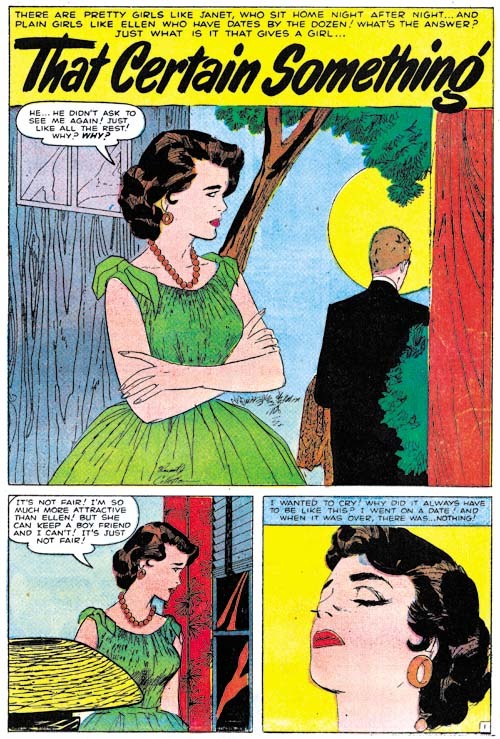 However artists who worked the Marvel Method did much more than plotting. While we normally think of authors as writers the definition includes creators. 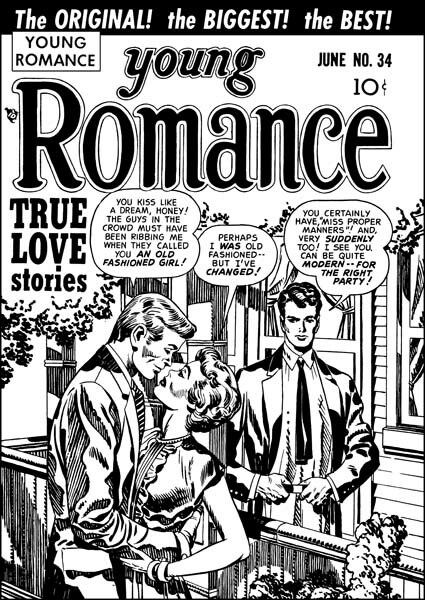 Therefore I think it is quite appropriate to describe Lee/Kirby (or Lee/Ditko, etc.) as the authors of the comics that they collaborated on. The first time I had heard the term “Auteur” applied to Jack Kirby was at the NY Comic Con in 2011 when there was a seminar on that subject. Actually that was my first time as well. It was a great presentation by Arlen Schumer along with panelists Rand Hoppe, John Morrow, J. David Spurlock and Michael Bonestell. There is a summary of what would be presented here. It is too bad that Barry Pearl did not review this summary. Perhaps he would not have stated that they were advocating Kirby as the actual and sole creator. No, Schumer and all the panelists that I can remember gave credit to Stan Lee as well. By no means was there a claim that Kirby did it all by himself. Or perhaps then he would not have stated that the Jack Kirby as Auteur concept takes credit away from other creators. No it was explicitly stated that the term auteur could also be applied to Steve Ditko and any of the other artists who worked under the Marvel Method. But the idea of a film director as auteur is based on movies that are very much a collaborative effort. I have a lot of respect for Barry so I wonder at what prompted such an inaccurate post. Perhaps Pearl’s post was not a response to Schumer’s theory but a distorted version of it by someone else. I no longer follow any Kirby list as they all seem to attract Kirby Cultists. It is not the extremes of their positions that bothers me so much as their lack of manners in their avocation (name calling and disrespect for alternate views). I can easily envision the use Kirby Cultists would make with a distorted version of Kirby as Auteur. But it would be unfortunate if Barry’s post was a response to a distorted version of the Auteur Theory because the true version is worthy of much thoughtful discussion. I am afraid I have been very busy helping the Simon family. I hope to resume normal posting soon. In the mean time there are some things I would like to share. 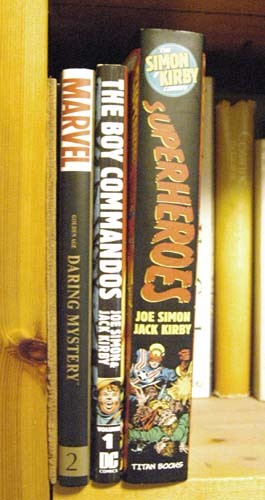 Superheroes have not been high on my reading lists although at one time I closely followed Captain America. 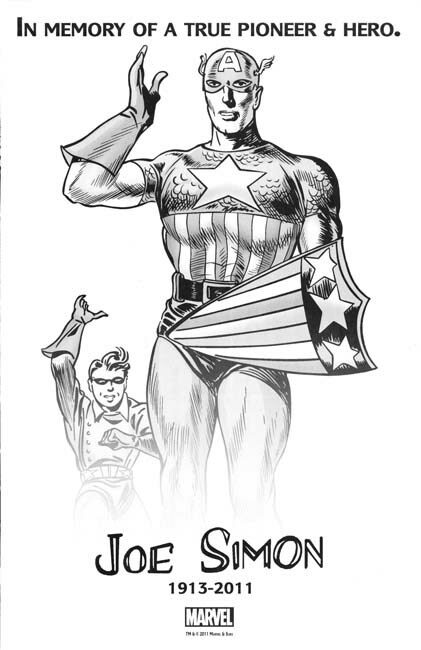 However I became disenchanted with the writing for that series after Captain America’s death. This is not a rant and I understand that changes will be made to a title from time to time. But I feel that if one is not happy with what he is reading then why read it anymore. There was one limited series that I had been following that seemingly gone into limbo some time ago. Recently The Twelve have been revived so I picked up a copy. While reading it I came across a rather unexpected surprise. I have always had a very favorable opinion of Tom Brevoort but now even more so. 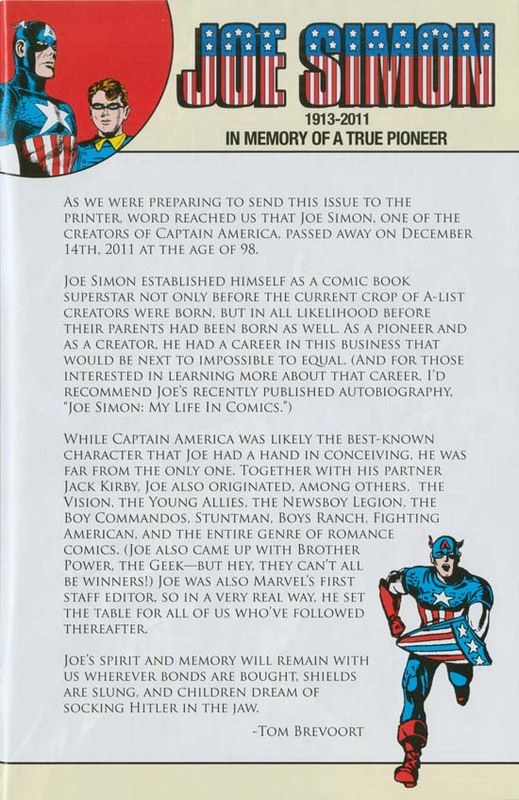 I get the impression that many fans believe that Joe Simon had an antagonistic relationship with Marvel. Yes Joe went into a legal battle with Marvel over Captain America copyrights not once but twice. But Joe was satisfied with the agreement he finally reached with Marvel. In fact Joe provided some nice statements to the media during Marvel’s death of Captain America event. He once again provided publicity for the recent blockbuster Captain America movie. That included an interview that can be found on the blue ray of the movie. Many comic book professionals had good things to say about Joe but some went a little further to show their appreciation. 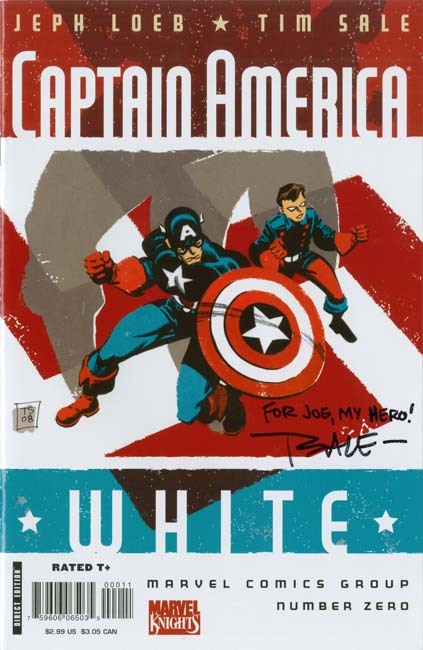 Among Joe’s possession was this copy of Captain America White signed by Tim Sale. I do not know how Mr. Sale got this copy to Joe but it is nice to see that he was willing to go through a little extra effort. This has special meaning for me because I am a big fan of Loeb and Sale’s work. While a number of writers and artists like to rewrite comic book history, I feel Loeb and Sale explore it. So thank you Marvel, Tom Brevoort and Tim Sale for these class acts. Posted November 27, 2010 in 2010/11, My Two Cents, z Archive. I have been reading a number of reviews of “The Simon and Kirby Superheroes”. One recent and rather nice one is from Ain’t It Cool News. There are other reviews that are complimentary but a surprising number of them comment on the cost of the book ($49.95 list, but of course much cheaper at online book distributors like Amazon). I can understand, especially in these economically trying times, that the price of a book is an important issue. What surprises me is that in all the reviews of DC Archives or Marvel Masterworks I have read not one commented on the price those volumes. Yet they list at about the same as “The Simon and Kirby Superheroes” (the Boy Commandos archive is $49.99 and the Daring Mystery Marvel Masterworks is $59.99). I would have bought a copy DC’s Boy Commandoes archive had I not been given a copy. However I still regret deviating from my policy of avoiding Marvel Masterworks to buy Daring Mystery volume 2. Price is not the issue, or at least not the most important issue. When I buy a reprint I want to read and see the work of the original artists. Reprints based on scans provide that. Now some restorations of scans are better than others and I admit that I prefer my own. But even poorly restored scans are better than recreated art. People keep commenting to me that many of the recent reprints based on scans are disrespectful to the original artists. I find it hard to understand what could be more disrespectful than recreating the work by those artists.